(a) Some leakage flux is present at both primary and secondary sides. This leakage gives rise to leakage reactances at both sides, which are denoted as X1 and X2 respectively. 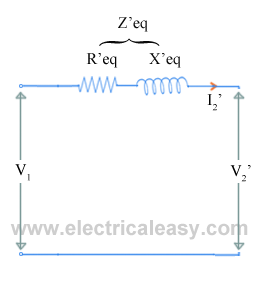 (b) Both the primary and secondary winding possesses resistance, denoted as R1 and R2 respectively. These resistances causes voltage drop as, I1R1 and I2R2 and also copper loss I12R1 and I22R2. (c) Permeability of the core can not be infinite, hence some magnetizing current is needed. Mutual flux also causes core loss in iron parts of the transformer. We need to consider all the above things to derive equivalent circuit of a transformer. 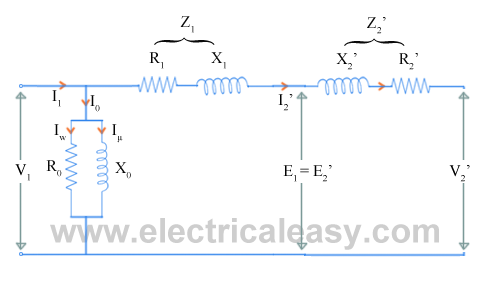 Resistances and reactances of transformer, which are described above, can be imagined separately from the windings (as shown in the figure below). Hence, the function of windings, thereafter, will only be the transforming the voltage. 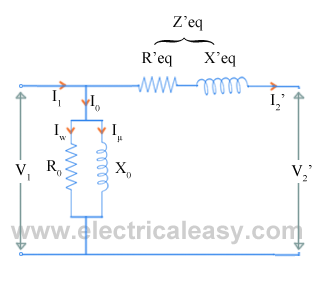 The no load current I0 is divided into, pure inductance X0 (taking magnetizing components Iμ) and non induction resistance R0 (taking working component Iw) which are connected into parallel across the primary. The value of E1 can be obtained by subtracting I1Z1 from V1. The value of R0 and X0 can be calculated as, R0 = E1 / Iw and X0 = E1 / Iμ. But, using this equivalent circuit does not simplifies the calculations. To make calculations simpler, it is preferable to transfer current, voltage and impedance either to primary side or to the secondary side. In that case, we would have to work with only one winding which is more convenient. Now, lets refer the parameters of secondary side to primary. where, Z2' = (N1/N2)2Z2 = K2Z2. ............where K= N1/N2. R2' = K2R2 and X2' = K2X2 . 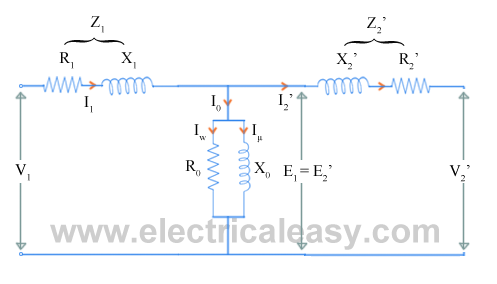 The following figure shows the equivalent circuit of transformer with secondary parameters referred to the primary. Now, as the values of winding resistance and leakage reactance are so small that, V1 and E1 can be assumed to be equal. Therefore, the exciting current drawn by the parallel combination of R0 and X0 would not affect significantly, if we move it to the input terminals as shown in the figure below.